Are ‘Healthy’ Fast Food Options Really Better for You? When you visit a fast food restaurant, do you choose a salad and yogurt parfait thinking they are healthier than a burger and fries? Or do you perhaps opt for the fish sandwich? Well, think again. These options may not be much better for you than a Big Mac. Many fast food eateries have recently introduced menu items that offer consumers seemingly “healthier” options as the nation grapples with a growing obesity problem. McDonald’s (MCD) added the McWrap last week, Burger King (BKW) rolled out the turkey burger for a limited time on March 20, and Wendy’s (WEN) has been offering two types of flatbread sandwiches since March 26. Also, starting April 22, McDonald’s will add an egg-white only option to its breakfast sandwich selection. "What's prompted many of these new menu items is really around choice," says Dr. Cindy Goody, senior director of nutrition at McDonald's. She says customers wanted additional choices to the burger and fried standard -- including more fruit. The catch is that, even though these new menu items may seem healthier, in reality they aren’t much better than other items on the menu because of the large amounts of sodium and fat they contain. “Right now, the state of the fast food restaurant business is that nothing is good,” says Janis Jibrin, lead nutritionist at TheBestLife.com. For instance, Burger King’s turkey burger contains 1,210 mg of sodium and 26 g of fat, with a total of 530 calories. 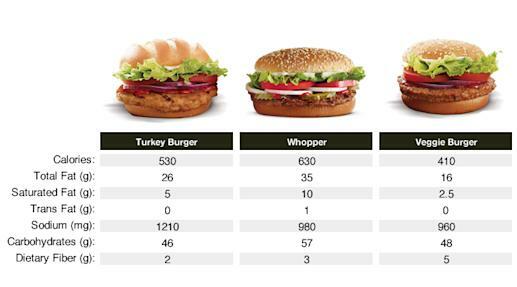 Compare that to the Whopper, which has LESS sodium (980 mg), 35g of fat and 630 calories. Those turkey stats aren’t looking so great, are they? Similarly, Wendy’s introduced the Smoky Honey Mustard and the Asiago Ranch flatbread grilled chicken sandwiches. 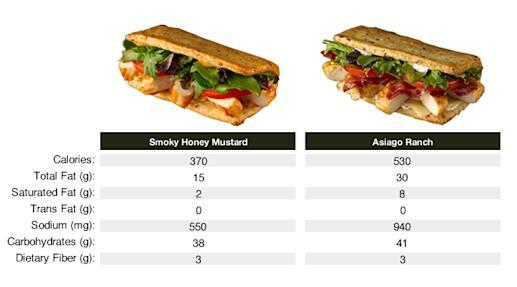 In its press release, the Smoky Honey Mustard sandwich is touted as being only 370 calories and containing protein, vitamins and fiber. But it still contains 550 mg of sodium. The Asiago contains a whopping 940 mg of sodium and 530 calories. And how about salads? How healthy they are often depends on which toppings you add. For example, McDonald’s Premium Southwest Salad with Crispy Chicken has 450 calories and contains 820 mg of sodium, almost the same as the two-patty McDouble sandwich. It might surprise you how much sodium salad dressings and condiments contain. One packet of McDonald's Caesar dressing has 500 mg of sodium, and a packet of ketchup contains 100 mg. Jibrin recommends 2,300 mg of sodium per day; 1,500 for people with high blood pressure or otherwise at risk for heart disease. At the lower cut-off, just one packet of dressing is a third of your daily intake, and a single packet of ketchup would be nearly a tenth. So how to choose the healthiest option at a fast food restaurant? “If you’re at a fast food place, the best thing for you to do is to get the smallest portion of whatever you want to eat,” Fendt says. “If you had a plain hamburger, that gives you about 200 calories. You’re still getting a hamburger, but it’s a smaller version.” She adds that a side salad without the dressing is only 20 calories. Compare that to a small side of french fries, which has ten times the calories. 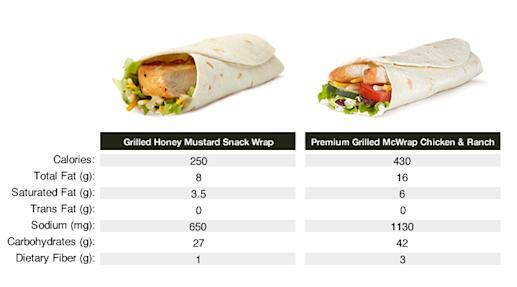 If focusing only on calories, a customer may choose a McDonald’s snack size McWrap. For instance, a Grilled Honey Mustard Snack Wrap is only 250 calories. But if you look carefully at the nutrition information, you'll see the snack wrap still contains 650 mg of sodium and 8 grams of fat, while the full-size McWrap contains 1,130 mg of sodium and 16 g of fat. Some people will need two snack wraps to fill up; this amounts to 500 calories and 1,300 mg of sodium, more than one full-size wrap. So smaller may not always be better. 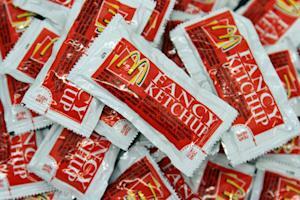 In addition, Goody says consumers can ask for fries without salt or condiments, which would save about 90 calories. Fendt advises that each person is different and thus the health focus will vary. She says that, for those who care about maintaining a healthy weight, the focus should be on calories; for hypertension, sodium; and for diabetes, carbohydrates. Even those who don’t have high blood pressure may find their numbers rising if they ingest too much sodium. Plus, she adds, eating lots of salty foods can train your taste buds into finding healthier options to be too bland. For those people who have more than one health condition, the process gets a bit more complicated. For example, nearly 40% of Americans are obese and have hypertension, according to the Centers for Disease Control and Prevention. So if you fall into that category, do you choose lower calories or lower sodium? The answer is both. In that case, “portion sizes are the biggest issue,” Fendt says. If your portion size is smaller, then the sodium, fat and calorie levels are all going to be lower. Also, Fendt says, if you have a choice of which fast food restaurant to frequent, then “a place like Chipotle or Baja Fresh, where you have the option to have vegetables, is a good bet.” But again, portion size matters as well because a 1,000-calorie burrito won’t help your waistline. 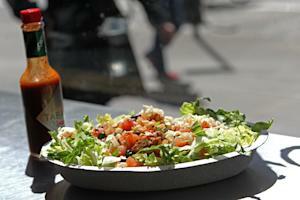 Chipotle's spokesperson Chris Arnold says the company's "commitment is to better ingredients." Since the restaurant added the healthier brown rice option, a third of their rice sales have been of the brown variety. In reality, the best option for health is to cook at home. But if you need to make it work while eating out, Jibrin says pairing a side salad with a relatively lower-calorie sandwich is smart. She also suggests you bring a packet of almonds about the size of a quarter cup to add to a low-calorie salad with dressing. The salad and dressing would total around 250 calories and the almonds would bring the meal to an acceptable 450 calories. In addition, healthful options and actual numbers for fast food restaurants are hard to pin down because they have to be formalized into a “healthful” category, as noted in a New York Times article. Most fast food restaurants do not carry a specific line of products noted as "healthy." Many chains offer lighter food options but they often aren’t as flavorful. Plus, the majority of the purchases are still the fatty burgers, sandwiches and fries. So until truly healthy options have a huge demand, restaurants aren’t going to stock them as much and they also won’t be as palatable, Fendt says. The bottom line is that the “healthier” choices at fast food restaurants are based on what matters to you and what kind of food choices you make. The best way to choose wisely is to look at the full nutritional information, which is often available on company websites and inside the restaurants.